Long gone are the days of Berliners serving up overly acidic filtered coffee topped with whipped cream and labeling it a “cappuccino”. 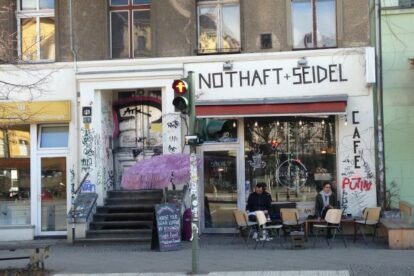 A lot of cafés have popped up in the midst of Berlin 2.0 coffee culture, but Nothaft + Seidel, a bustling spot situated only meters away from the busy entrance to Eberswalder Str. U-Bahn stop, has managed to establish a name for itself in the midst of all of them. It’s because they really know how to make coffee. I like to tank up here with a flat white on a sunny afternoon. The coffee’s strong, it’s the right temperature, and the milk has the perfect texture. What more could you want? If that isn’t enough to tempt you, they also have really delicious flatbread sandwiches grilled to order. And if you’re looking for a longer stay, say for work, they have light and spacious rooms in the back to spread out.